For all his withering critique of society in his journal, Rorschach was once involved in protecting it. We immediately realize that, in a way, his pessimism is him bemoaning his own failures. 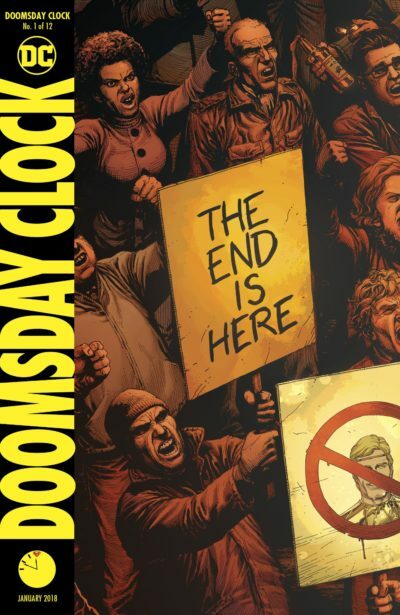 Doomsday Clock has just one cutaway from its primary narrative – a scene of the evacuations of the city. There’s much less room for unspoken context. Once the opening six pages of world-building end, we follow Rorschach straight through to the hard cut to Lois and Clark in bed at the end of the issue. Rorschach is concerned with freeing a particular villain from prison under the cover of evacuation before a potential nuclear strike. She is Erika Manson – “The Marionette” – new to the world of Watchmen, but drawn from a Charlton Comics parallel just like most of Moore and Gibbon’s characters. Why he matters and if the rest of the team is in danger is a thread that unravels the entire narrative. We find ourselves asking the same thing about Manson. “Why this woman,” we wonder, “and how is it that she might ‘find god’?” Why is Rorschach initially resistant to bringing along her husband, The Mime, yet then so willing? Will his inclusion help or hinder finding god? In the course of Rorschach’s negotiation with The Marionette, we get another parallel to Watchmen #1: just as Dan Dreiberg was a new Nite Owl, we learn this is not our original Rorschach. This revelation is almost lost in the issue. Rorschach pulls off a glove to show what seems to be a black- or brown-skinned hand, when The Marionette apparently knew his original hand to be white. The coloring of Doomsday Clock is such a shadowy, orange muddle that the reveal packs no punch. Only a page later, when we see his hand next to Manson’s white skin, does the reveal click. The coloring stumble is one symptom of a greater problem of the Gary Frank line work and Brad Anderson colors across the issue. They’re just too much. Frank’s artwork is attractive and has many nods to Gibbon’s style, but often feels weighted with too much ink. Gibbons’ obsessedly-detailed panels were always ink-filled, but still had moments of seeming minimalism. Frank cannot stop piling on shading lines that are rendered moot by digital colors doing all of the shading for him. He drops as much ink on Manson’s neck as Gibbons’ did on Dr. Manhattan’s entire monotone blue body in order to lend it some sense of weight and dimension. Anderson’s oversaturated coloring is hard to bear, so muddy it feels at points like it is sepia-toned. It’s not just the bungled reveal of Rorschach’s hand, but the onslaught of brown, orange, and gray in every panel. Everything feels oversaturated but nothing feels bright until the pop of Ozymandius’s costume and, later, the transition to the DC Universe proper. That’s narratively effective, but it’s a heavy-handed device. Gibbons and Higgins achieved the same effect with Dr. Manhattan’s introduction even though they had already used many of the colors of that scene in their palette earlier in the issue. The heavy lines and muddy colors of Doomsday Clock only emphasize the claustrophobia of the narrative. We stick with Rorschach, The Marionette, and the Mime throughout the issue as they trek back into the heart of the city. The issue feel small, which puts the emphasis its decompression. There are two or three pages in the journey which are wholly unnecessary – they convey no unique information. They seem to exist purely because there is nothing else to take their place. 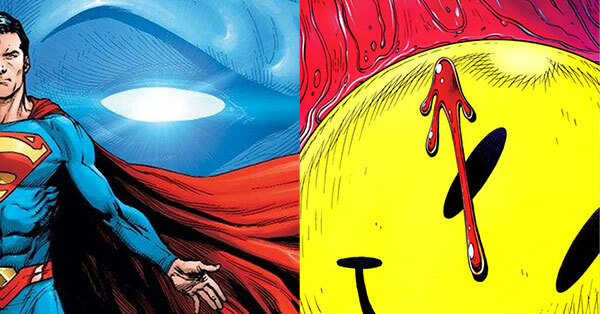 Watchmen was a social commentary, a puzzle box, and a murder mystery. Its first issue was paced deliberately to introduce us to the full scope of its city and its cast. The scene between Rorschach and Ozymandias in Watchmen #1 is especially heavy with portentous meaning that cannot be understood on an initial reading. Yet, we never feel that Moore and Gibbons are holding back. This is a complete chapter that only becomes more fulfilling as you learn more. Doomsday Clock is also full of social commentary, though Johns version feels cartoonishly ham-handed in the present day. It’s also pregnant with moments where we are certainly missing the full context, but instead of being portentous they feel deliberately incomplete. We can feel Geoff Johns building a mystery by omission rather than by inclusion. Now we come to the final pages. In both issues, they are examples of humanity, though that comes with a footnote in Doomsday Clock. In Watchmen, Dan and Laurie head out to dinner together. They are able to shed their heroic mantles in a way that Rorschach and Dr. Manhattan cannot (and in a way the Comedian could not seem to enjoy). It’s subtle, but narratively important – a thread that will carry us through the closing frames of the story. 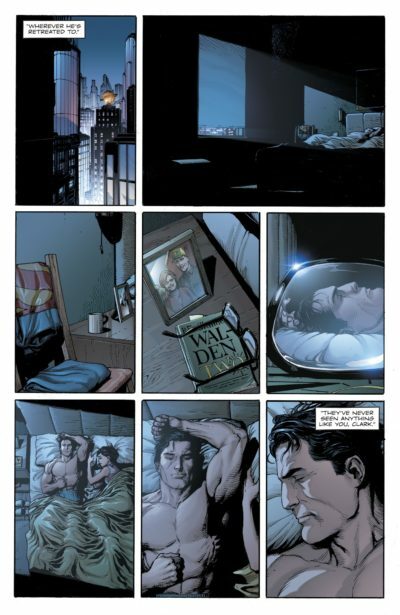 In Doomsday Clock, we are pulled through the window of Lois and Clark’s Metropolis apartment and into Clark’s nightmare remembrance of his parent’s death. It’s a confusing turn if you haven’t been following DC Rebirth, and maybe even if you have been. The Kents dying in a car crash was never an element of Superman’s mythology until the New 52 Superman in 2011. That Superman is dead, as of 2016, but in 2017 some elements of his memories and narrative were merged into the newly-returned classic Clark in the “Superman Reborn story.” Since that classic Clark has no history on this post-New 52 Earth, he might as well remember things the way its Clark knew them. There’s no other truth to be had. Which Clark are we seeing here? It would make sense for it to be the current one, yet I’m not so sure. There is no hint of his son with Lois in the sparse decor of their Metropolis bedroom. Neither character seems to be wearing a wedding ring. And, the neatly-folded Superman costume draped over a chair seems to be the t-shirt and jeans look sported by the New 52 Superman. Does it matter which version of Clark we’re seeing here? Maybe. If it is the classic Clark in the present day, he is being troubled by exactly the sort of difference in universes seemingly caused by Dr. Manhattan’s interference. If it is a flashback to the dead New 52 Clark, we could be seeing the very moment that a massive, invisible, blue hand reaches in and begins to tamper with reality. That’s the sort of comic continuity muddle that Watchmen was more likely to satirize than include. Surely a modern Watchmen would include many jabs at alternate dimensions and altered memories, probably still using Dr. Manhattan as a device. Will Johns use the deus ex machina of Dr. Manhattan to poke fun at the hands that steer all of these confusing, universe-altering acts of editorial interference, just as Grant Morrison inserted himself into his run on Animal Man? 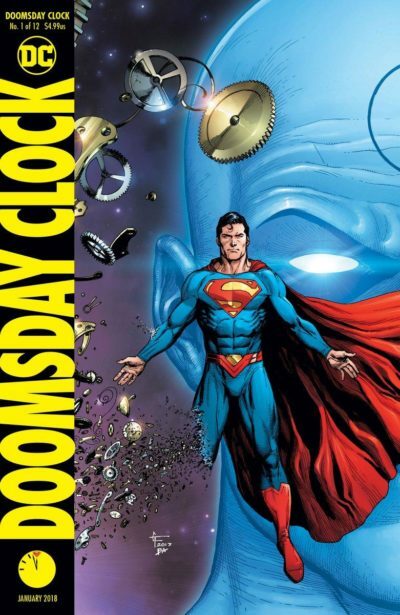 Or, will Doomsday Clock be an irony-free crossover that is totally self-serious in its presentation of Dr. Manhattan as a universal meddler? Only the next 11 months will tell. No matter what they unfurl, they cannot change that Doomsday Clock #1 is a lackluster issue. 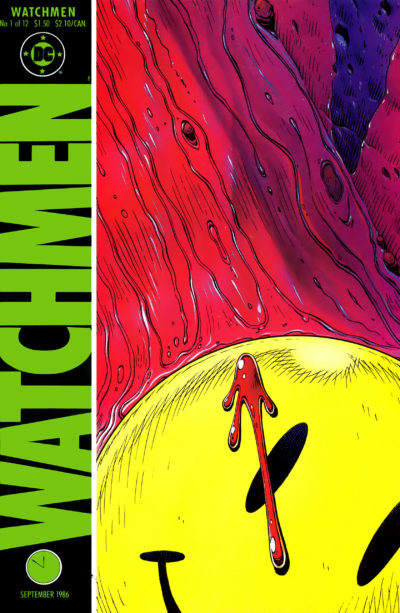 It’s impeccably constructed but missing the scenes and smaller moments that made Watchmen #1 an unqualified classic even before its event came to a close. I don’t think the answer was to be be more slavishly devoted to the original – if anything, I think Doomsday Clock may have hewed too close to Watchmen without finding its own unique alchemy. Seems rather harsh when you introduce it as it’s own piece while hating on comparison aspects thru out. Rate it on it’s own and try again. If your mood is it’s a speculative period piece vs watchman with no further context then your reviews are very unbalanced. I expected more from you. I appreciate you sharing that critique of my review! I agree that there is discontinuity between the commentary in the intro and the style of the review. I try to write intros in a way that are more accessible to my non-comics readers, but in this case it doesn’t really introduce the idea of a comparison review very well at all. I definitely can do better. However, if you are reacting purely to the star rating, you should know that 2.0 isn’t an unusually low or harsh score for me regardless of if I’m comparing one thing to another. I’ve read 1572 comics this year and my average score is 3.08. I treat 2.5 as “truly average.” I thought this book was a bit less than average, thus the score.